Newly-discovered fossil deposit contains more than 50 unknown species from the Cambrian Explosion, when most complex body plans appeared. 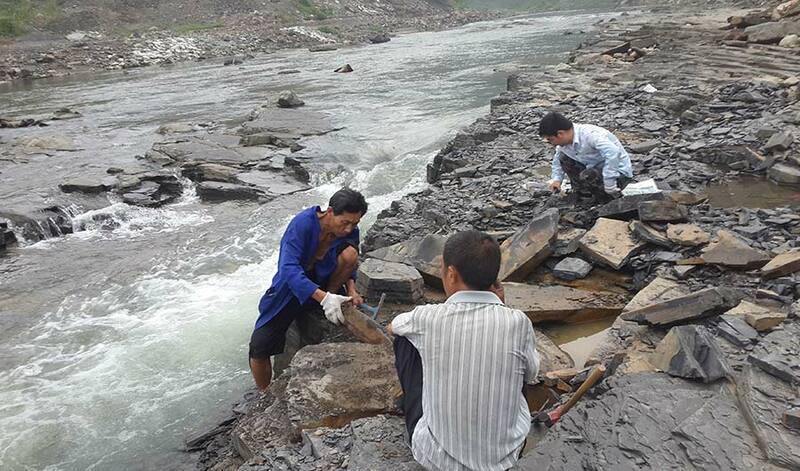 Team digging up Qingjiang Fossils along the Danshui River, in Hubei Province, China. (Inside Science) -- A new trove of outstandingly preserved fossils in China from the dawn of animal life rivals the horde of weird creatures found in legendary sites such as the Burgess Shale, and may shed light on many puzzles concerning the animal family tree, a new study finds. The earliest hints of life in the roughly 4.5 billion-year history of Earth may have appeared 3.95 billion years ago, but for a long time after that, life consisted of relatively simple organisms. However, about 540 million years ago, early in the Cambrian period, the simple animal life that already existed exploded in complexity and diversity. During this outburst, known as the Cambrian explosion, all the major groups of animals seemed to appear rapidly. Much of what scientists know about the Cambrian explosion started with the 508 million-year-old site known as the Burgess Shale, discovered in 1909 in the Canadian Rocky Mountains, which exquisitely preserved fossils of many soft body parts, including skin, eyes, guts and brains. This site not only contains members of nearly all major animal groups alive nowadays, but also creatures with strange anatomies that do not resemble any organism seen today, leading to lively debates as to how they might be related to living animals. The past decade has seen a big jump in the discovery of new Burgess Shale-type fossil sites, with researchers examining geological maps and seeking out the kinds of rock they know have a high potential of preserving these fossils, said paleontologist Allison Daley at the University of Lausanne in Switzerland. Now scientists have revealed new Cambrian fossils from China that not only rival the quality and diversity of fossils at the Burgess Shale, but also reveal an unexpectedly large number of previously unknown species from the Cambrian explosion. The newfound fossil bounty is located on a bank of the Danshui River in the southern Chinese province of Hubei. At roughly 518 million years old, this collection, dubbed the Qingjiang biota, is about 10 million years older than the Burgess Shale and thus closer to the start of the Cambrian explosion, said study co-author Xingliang Zhang, a paleontologist at Northwest University in Xi'an, China. Of the 101 animal species identified from the Qingjiang biota so far, more than 50 were previously unknown to science. Moreover, "the fossils are really exceptionally preserved, including soft tissues that you don't normally see in the fossil record," said paleontologist Jean-Bernard Caron at the Royal Ontario Museum in Toronto, who did not take part in this research. "It's basically a new window to the Cambrian world." This fossil trove may fill gaps of knowledge concerning animals largely missing at other Cambrian sites, such as the cnidarians, stinging creatures that include jellyfish and sea anemones. "Cnidarians are extremely rare in other Cambrian sites, but are very well-preserved and make up more than a third of the specimens reported at the Qingjiang biota," Caron said. The Qingjiang biota also includes many ctenophores or comb jellies, "which in modern seas are sort of jellyfishlike animals with beautiful coloration," said Daley, who did not participate in this work, but wrote an editorial that accompanied the published study. Scientists have debated over whether ctenophores, sponges or cnidarians are the most ancient members of the animal family tree, and fossils from the Qingjiang biota "may help solve the problem of which animal group evolved first," she said. The discovery of creatures known as kinorhynchs, or "mud dragons," in the Qingjiang biota was highly surprising, Daley said. Today, these invertebrates are roughly 1 millimeter long or less and live buried in marine sediments, but the Qingjiang biota reveals they could get up to 4 centimeters long and apparently lived on top of the seafloor instead. "These fossils may shed light on some of these weird and poorly understood animal groups that are still alive today," Daley said. The Qingjiang biota may also help solve mysteries regarding enigmatic ancient groups of creatures such as the somewhat tadpole-shaped vetulicolians. Scientists have faced great difficulties pinpointing how vetulicolians were related to other animals, but "the new fossils could potentially allow us to fix vetulicolians on the tree of life," Daley said. These findings may yield key insights on the relatively sketchy picture scientists currently have of the dawn of animal life, Caron said. "Many new things remain to be found, and hold a great potential to solve many questions," Zhang said. The scientists detailed their findings in the March 22 issue of the journal Science.